It’s fairly typical in Enterprise IT environments that the provided Windows 7 desktops are locked down. This blog post walks through installing the Data ONTAP PowerShell Toolkit in such an environment, where there are certain restrictions, but fortunately not enough to stop us from installing and using the Data ONTAP PowerShell Toolkit. Windows 7 has .NET 3.5 by default. Using PowerShell 2 must be permitted on the corporate desktop. In order to run the DataONTAP module in PowerShell, the Execution Policy must be set to unrestricted. This may be where you’ll encounter a problem with your corporate desktop - you may not be able to turn off UAC! If you’re in luck and the Execution Policy is already/now unrestricted, we can continue. - then hopefully it will let you download the DataONTAP.zip file. And we carry on from having downloaded the ZIP file. Important! Before unzipping, click the ‘Unblock’ button from the file properties. 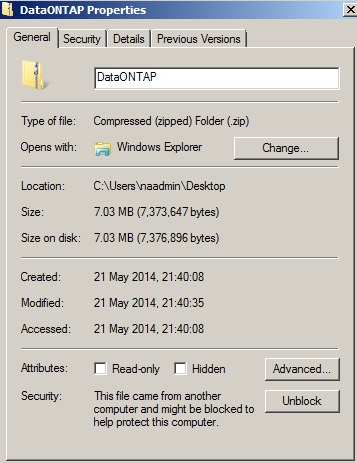 Unzipping DataONTAP.zip reveals a folder inside called DataONTAP with a few other folders and files in (mostly DLLs.) Copy this folder. Assuming the corporate security policy blocks adding stuff into system32 (also, perhaps you only want this for your login); here we’ll use option 2. Firstly, create the folder structure \WindowsPowerShell\Modules in Documents if it does not exist.